The students of Troy City School District have spoken. With more than 55 percent of votes, the results of the November 3 district-wide mock presidential election show Democratic nominee Hillary Clinton as the winner. Republican nominee Donald Trump came in second with more than 22 percent of votes. The remainder were cast for write-in and third party candidates. 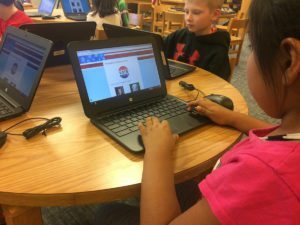 While the vast majority of students are too young to vote in the real election, students in Grades K-12 took to the “polls” in their classrooms. In this case, students used Google Forms to cast their vote on Chromebooks. The results were then broadcast to students via state-of-the-art videoconferencing technology, installed in every classroom last summer. The experience is the culmination of several months of instruction on various facets of the election. Teachers have created myriad age-appropriate projects and lessons with the hope that students will become more informed on the process, the issues and the candidates themselves. Teachers say that this kind of instruction gives students the opportunity to create their own opinions based on research rather than the opinion of others. “We want our students making informed decisions and thinking critically about the issues facing our country,” said Chapkoski. “By modeling responsible voting, we are helping engage the next generation of civic minded citizens.